A powerful march of peace and unity took place today in Los Angeles. 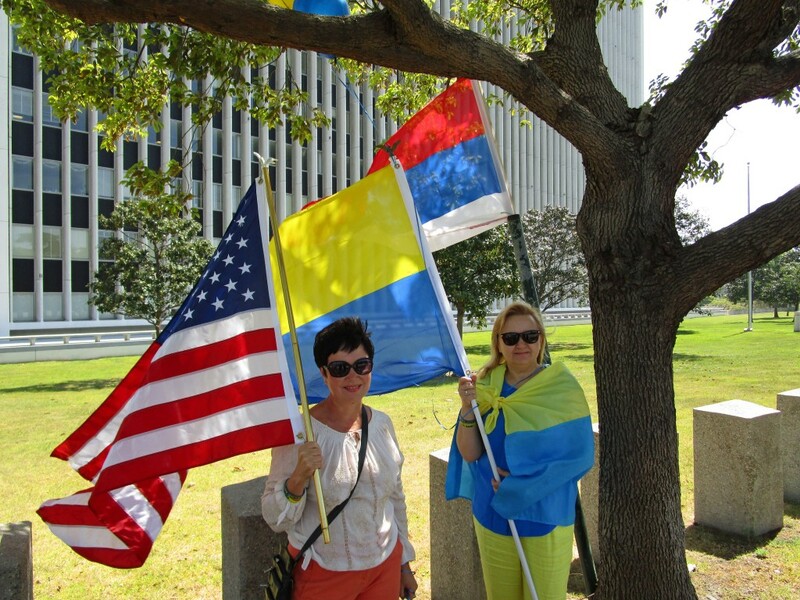 Russians, Ukrainians and Americans came together for the March of Peace and Freedom. Organizers of this event stated: “We know that the power in the Kremlin does not represent the whole of Russia, nor all the Russian communities in foreign countries. Russian propaganda created a huge gap between Ukrainian and Russian people, bringing hostility and hatred, which will be passed on to the next generation if we do not act quickly.” They aim to stop the war between Russia and Ukraine, to defend the independence of Ukraine, and to restore intelligence and democracy in Russia. The march honored the memory of the late Boris Nemtsov and demanded the release of Nadiya Savchenko, Oleg Sentsov and other Ukrainian POW’s illegally held in Russian prisons. One of the organizers of the march, Alina Chorna, spoke of the widening gap between Russia and Ukraine – two brotherly nations, divided by Putin’s politics of terror and aggression. She also expressed deep alarm about the damage caused by the exceedingly deceitful Russian propaganda. Outright fakes and distortions spread by Putin’s spin masters divide families and nations. The march sought to remedy some of the damage by showing the world that freethinking Russians and Ukrainians bear no hatred towards each other. The event also wanted to give a voice to the people of Moscow, who weren’t able to hold their own march on the same date, as originally planned. Under the blue skies of sunny Los Angeles, participants of the march mixed and mingled, greeted by motorists who honked their horns in support of the colorful rally. They spoke of the upcoming Hollywood Festival of the best Ukrainian films, charities that gather funds for Ukraine like Save Lives Together Foundation and engaged in lively discussions about the situation in Ukraine and Russia. There were no language barriers, no stereotypes and no disagreements. The march clearly demonstrated that freedom-minded Ukrainians, Russians and Americans have the same goals: peace, liberty, freedom and democracy. As the people stand united, their voices will not be silenced.